This rocky raised bed wraps around a cherry blossom tree right beside our house. I’m not sure how successful it will be as a vege patch, given that I’ve had to chase the dogs out of it twice already today, but it’s as close as you can get to our kitchen. So far it’s home to lettuce, carrots, garlic, onions, spuds, rocket, celery, globe artichokes and mint. I’m ditching the designer potager look this season. My garden’s too big to plant flowers, herbs and vegetables all together in a happy jumble, the way you can in cute raised beds in the city. It will just end up looking like a big mess. Instead, I’m going back to the future. I’m planting my vege patch in perfectly straight rows (I laid down the rake to make the trenches) that any grandfather would be proud of. And my next job? 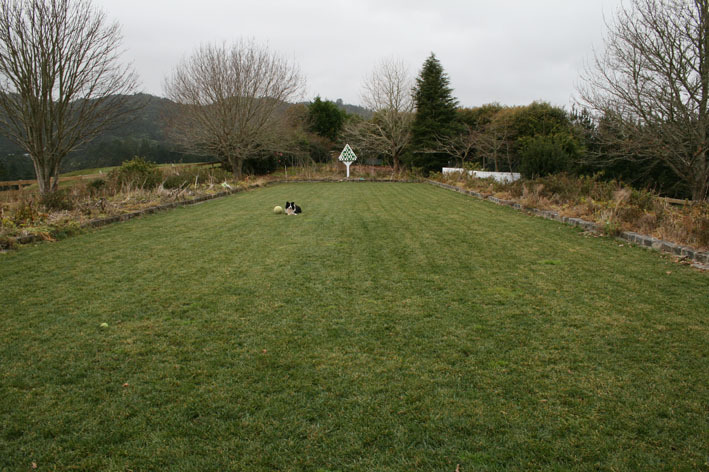 We’re going to rotary hoe up the 35m long borders along each side of the lawn, where we sowed wildflowers last summer for our wedding, then fill them up with neat rows of food crops and flowers for picking. It’s going to look fantastic. Which is just as well, because it couldn’t look any worse than it does now. It’s just as well the lawn is still picture perfect. Thanks Vicki. I think the other word you could use is “obsessive”, but I figure being obsessive about gardening doesn’t do any harm to anyone (except maybe my Visa card). i am also in the country and as much as I would love a designer looking vegie garden there are benefits to having a “back to the future” garden the rotary hoe and tractors make light work of digging over. I still insist on planting marigolds sure if they protect at all, which does make the garden look prettier. Look forward to seeing more photos of your garden as it progresses. I also have two punnets of calendulas to plant. Just have to wrangle the baby into his bassinet so I can get out there! I was really happy to read this post because I’m planning on doing the same thing this weekend. I have a question though, I have been turning a Lupin, Mustard seed mix and wondering how long before I can start planting? You can start planting straight away after digging in a green crop. It doesn’t matter that it hasn’t broken down yet. Get that spade out! You inspire me to work harder than I already do! Are you going to sell your potatoes at the Clevedon market? That’s the plan. And berries, although as I haven’t quite got around to digging the berry beds yet, that plan might have to wait until next summer! Hi Linda, I have planted pretty much the same as you except I haven’t done the potatoes yet – bit scared but I really love to have new potatoes for Christmas! Having trouble with the slugs on my cauli’s though 😦 Can I plant beetroot yet? It’s my new favourite veg – roasted beetroot with garlic in olive oil, yum! I think it is a bit early for beetroot… but having said that I have to confess that I have a whole tray of beetroot seedlings germinating in my mini plastic house. Breaking two rules at once: you really shouldn’t sow root crops in trays – they should always be sown direct – but I’m going to transplant them very gently! I don’t think I’d ever get tired of looking at that photo Lynda. It deserves to be on a canvas and at the least in a 2012 calendar. It is so appealing. The soil appears very dark – is it just your soil up there or have you shipped in something else? Last question: Have you ever made a scarecrow and if so, what did you use to stuff it? Yes – the soil is dark. I’ve mulched it with a fresh layer of bought compost. The rock wall is about 1m high around the back and it’s too wide to reach over, so I’m trying to slowly build up the soil level. (Plus what’s the point of having a husband who owns a tip-truck if you don’t occasionally use it to bring home a load of compost!) I’ve never made a scarecrow, but as a kid we used to make a guy for the Guy Fawkes bonfire and we’d stuff him with hay. (And dad also used to stuff his pillow-head with gunpowder but I’m sure that’s probably against the law these days!) If you can’t get hay, you can buy small bags of pea straw at the garden centre. Your 35 metre borders with neat rows of food crops and flowers sounds rather fabulous. I have gone a bit mad on dahlias – what would be some good companion planting ideas to go with them? I appreciate your taking the time to respond – your gardening enthusiasm is infectious! I’ll update the blog post with a “before” photo of the borders today. I love dahlias – have you thought about companion planting them with more dahlias (the single flowered sorts?). The single dahlias look like really large, cheerful daisies and the bees go mad for them. Other plants I’ve grown with my dahlias include David Austin roses (always plant the roses in front of the dahlias or they end up completely smothered by them), burgundy scabiosa, lychnis, echinaceas, perennial petunias (as a groundcover), federation daisies, cornflowers, lilies, zinnias, heaps of tall cosmos – really anything that takes full sun and flowers throughout summer. Wildflowers are great too, and osteospermum daisies (I like the whirlygig ones), though they’re a bit of a weed and I loathe the smell of the foliage. You are incredable with the energy you have.!! 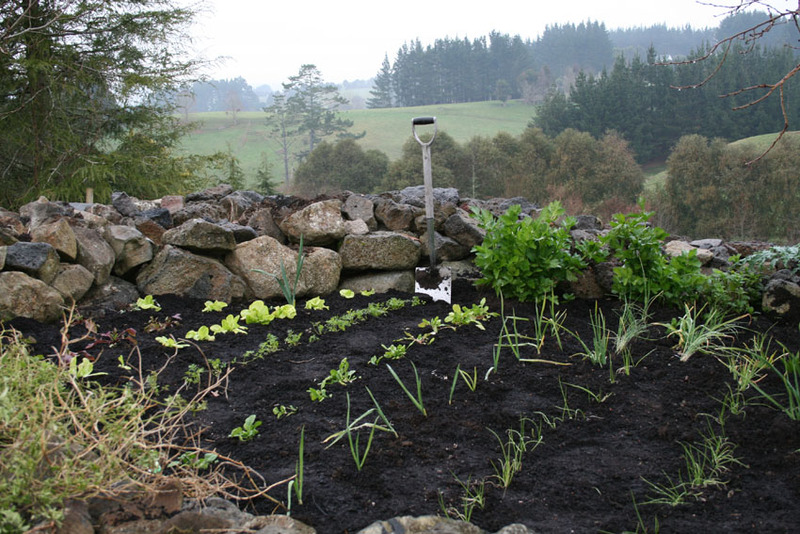 Your vege garden looks great planted in the raised stone wall. (A bit easier on the back too ) Would it be possible to put some raised chicken wire-netting over it to keep the dogs off it ? — and a view to die for. Just a beautiful setting. We are planting our strawberries and potatoes this weekend. Is a sunny day here in Gisborne. Won’t be long and wee Lucas will be out helping——— as fast as you plant, he will pull them out !!! Give him his own tub garden to plant. I think the dogs would probably just flatten chicken wire. We ended up rigging up a low electric fence to stop them sleeping on the hydrangeas in a bed around the side of our house last year, which worked pretty well until Jason needed the fencing unit to keep the cows out of the orchard instead. Now that garden looks like a bomb hit it, but as it’s dry and warm in winter, I can’t really blame them. Good luck with your spuds and strawberries. I put in 50 ‘Camarosa’ plants this year. Hi, thank you I do enjoy your emails, I think we must be on the same wave link for potatoes, I too planted some last week even thought the time to plant is at the end of the month as per the “moon therory”, I shall which ones do better. I also planted my snow peas again, this time if I do not get any germinate I will be going back to Yates as the seeds have a so call guarantee, this will be my 4th attempt. I do not have a great deal in at present but what is does look healthy at present. Good gardening I do hope your crops grow well, what a pity we do not live close to your markets, I would love to see your asparagus, we grew this crop commercially several years back. As soon as my asparagus comes up, I’ll be writing about it! I found out I was pregnant at the start of the fresh asparagus season last spring… I couldn’t abide the smell or taste of it, so I’m looking forward to it this year! I hope you have better luck with your snow peas. I’ve had trouble with them in the past too – the seeds sometimes rot in the seed-raising mix before they germinate. I suspect they like to be moist but not too wet at this time of the year.